Save your app to the Home screen. 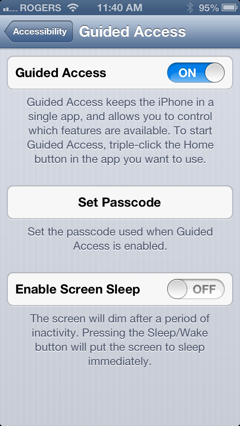 Go into Settings…General…Accessibility…Guided Access. Turn on Guided Access and set up a password. Start your app and click the Home button 3 times in a row. You will see your app, surrounded by the Guided Access screen. Select Options, and this is what you will see. Turn off the functions you don’t want the user to access. There is also an option to circle an area on the screen that you want to disable. Click Start. Your app will return to full screen. It will now be the only app that the user can run on the device. 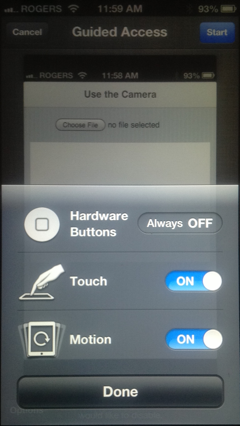 To get out of Kiosk mode, triple click on the Home button again. Enter the password, and your device will be back to normal. Next PostNext When do databases get overwritten?